UNIFIL Head of Mission and Force Commander, Major General Michael Beary, greets guests. The UNIFIL chief prepares to lay a wreath for the more than 300 fallen UNIFIL peacekeepers. Brig Gen Robert El Alam from the Lebanese Armed Forces salutes fallen UNIFIL peacekeepers. A UNIFIL peacekeeper from Ghana pauses during a moment of silence. UNIFIL currently has about 10,500 military and over 800 civilian personnel working to maintain peace. 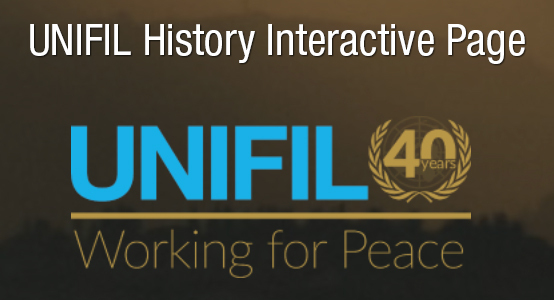 UNIFIL military peacekeepers are drawn from over 40 troop contributing countries. UNIFIL today observed the International Day of UN Peacekeepers at its headquarters in Naqoura, paying tribute to more than a million men and women for their service and sacrifice while working under the UN banner for the last 70-years. In his remarks during a ceremony at the UNIFIL Headquarters, UNIFIL Head of Mission and Force Commander, Major General Michael Beary, honoured the more than 300 UNIFIL peacekeepers who have lost their lives while serving for peace in south Lebanon since the Mission was established 40-years ago. The Force Commander stressed the importance of honouring those who made the ultimate sacrifice by continuing to call for a permanent ceasefire between the Lebanese Armed Forces (LAF) and the Israel Defense Forces (IDF) as well as a political solution for a permanent peace. “UNIFIL has created the space for the next steps that must be taken on our collective journey together,” he told the gathering of officials - from the Mission’s strategic partner, the LAF, to Lebanese officials, community leaders, members of the international community and fellow peacekeepers. Let’s use this “opportunity to urge the parties, our wider UN family and all stakeholders to redouble their efforts, so that current and future generations do not have to pay the same price as those that have gone before them,” he added, noting that UNIFIL also continues to do everything in its power to help shield Lebanon from any regional turmoil. Major General Beary stressed that the recent nearly 12-years of calm and stability have benefited communities and allowed for investment in infrastructure and construction. His remarks echoed the feelings of some of the people from south Lebanon, including Ahmad Al Kassem, a farmer from Yarin, who recently told UNIFIL’s Al Janoub magazine that the Mission’s presence provides a sense of reassurance. In December 2002, the UN General Assembly designated 29 May as the International Day of UN Peacekeepers in order to pay tribute to the professionalism, dedication and courage of all the men and women serving in uniform and as civilians in UN peacekeeping operations, and honour the memory of those who have lost their lives in the cause of peace. The global theme of this year’s observance is “UN Peacekeepers: 70 Years of Service and Sacrifice”. The Day was chosen to commemorate the establishment of the first UN peacekeeping mission, the UN Truce Supervision Organization (UNTSO), whose more than 50 observers assist UNIFIL daily in carrying out its mandate.